Sonakshi Sinha is busy promoting her upcoming film, Happy Phirr Bhag Jayegi,in full swing. The film is the sequel of the 2016 movie, Happy Bhag Jayegi, which starred Diana Penty. Sonakshi seems to have been attending back to back promotional events for her first release of 2018 – and true to her name in the film, Sonakshi seems happy, alright. We’re not just saying that thanks to Sonakshi’s infectious smile. We’re saying that mostly because of Sonakshi’s sartorial choices that are exuding nothing but happy vibes. For a promotional event just yesterday, Sonakshi opted for a fun, deep teal co-ord set from the Anita Dongre Grassroot collection. She paired her vibrant outfit with dangler earrings from Tachi and silver juttis from Needledust. 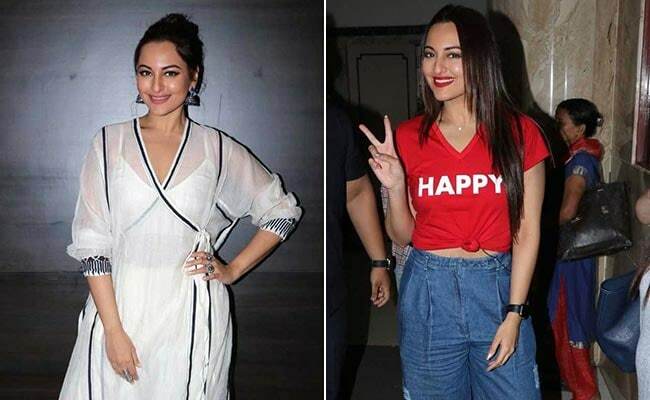 A day earlier while she was out promoting her film, Sonakshi decided to ditch the subtlety and opt for a t-shirt that let everyone know exactly how happy she was feeling. ‘Happy’ read her t-shirt and happy she did look. She paired the bright red knotted tee with straight legged jeans and a pair of white sneakers. This wasn’t the only time Sonakshi let her clothes do the talking. A few days ago Sonakshi sported another t-shirt with the word ‘happy’ printed on it. Only this time it was a white t-shirt which she paired with grey high-waisted, flared pants. We also absolutely loved Sonakshi’s pristine white look in an Ikai by Ragini Ahuja creation. Sonakshi looked ethereal in the ivory wrap kaftankameez set which featured tribal appliqué detail. She paired the ensemble with earrings from Amrapali and deep blue stilettos from Berleigh. Sonakshi seems to have later gotten out of the stilettos and into her favourite white sneakers. Comfort over fashion. We love it. Here’s hoping Sonakshi Sinha’s movie (and it’s collections) are just as happy as her current sartorial choices.